In John 9, we read about yet another miracle performed by Jesus. We see Jesus restore a blind man's sight. A blind man sees the light - in more ways than one. "I have come into this world so that the blind will see"
Though He didn't come into the world just for the small percentage of the world who are blind, you see, we are all blind without Jesus. He came to help us understand God's love for us. But hold on a second! When you read the second half of that verse, you see that Jesus says that He came here so that "those who see will become blind".... What's that all about?! It's easy to understand why Jesus would heal people - but it's hard to understand why He'd say that He would do the opposite! But Jesus isn't speaking literally here.... let me explain! We naturally connect vision and sight to "insight" or knowledge/understanding. You know how when someone is solving a problem they'll say "Ah! I see it now!". It's this tendency to explain understanding in terms of vision that Jesus is using. Jesus exploits this tendency in the double entendre we see here at the end of John 9. John 9:39-41 is based on the interactions between Jesus, the blind man and the Pharisees which we read about throughout the chapter. John 9:16 - The Pharisees insist that this could not have been done by God because it was done on the Sabbath, whilst others find the evidence hard to deny. John 9:17-27 - The Pharisees question the man's parents and then question the man again. They demand that he give God the glory since they "knew" that the man who did this was a "sinner"
John 9:28-29 - The Pharisees are "disciples of Moses" and the know that God spoke to Moses, but they don't know where "this Man", Jesus, is from. John 9:30-32 - The blind man stands strong in his faith, refuting the Pharisees argument that if He was really a sinner, God wouldn't want anything to do with him. This was something that they had never heard of happening before. John 9:33 - The blind man concludes that Jesus had to be of God or He wouldn't have been able to do anything. John 9:34-37 - The Pharisees were offended at this statement, declaring that the blind man was "born in sins" and banned him from the Jewish community. John 9:39-41 - The whole situation provides evidence for Jesus's claim; He came for judgement - allowing the blind to see and blinding those who "see". We can't take this statement literally - it never once says in the Bible that Jesus caused anyone who could physically see to become physically blind (though Paul does in Acts). Jesus's emphasis is not on physical vision, but on spiritual insight (this is the connection I was talking about above!). The blind man now believes that Jesus is the Son of God. He sees in a way he didn't see before. He was once a blind man in the midst of those who could see (physically), however, he is now one who sees in the midst of blind men (spiritually). Jesus does not blind those who "see" physically - nor does He intend to do so spiritually. The problem isn't with Jesus, it's in those who claim to "see" - in this case, the Pharisees. Jesus's statement there is obvious: If the Pharisees admitted their blindness (faults/wrongdoings/misclaims) they would be without sin, but since they say that they see, their sin remains. You see, the Pharisees are convinced that they know what is right. They are blinded by their complete conviction of their vision - they declare that the work of God did not come from God because it was not what they expected it to be according to their "vision". The Pharisees "vision" didn't come from humble beginnings, you see, it's based in their claim that they are Moses's disciples and are separated from the "sinners". They refused to listen to anything that went against their understanding because, clearly it must be wrong. The Pharisees refuse to see; they do not want to see; they do not want to be in that awkward place of having to admit that they're wrong. That still happens today. People still refuse to see. Some are afraid, ashamed, too proud, too stuck in their ways - and when they turn away from Jesus, they go further into the darkness. If we accept Jesus, God accepts us. If we reject Jesus, God rejects us. If we refuse the light, we can only have darkness. Jesus is the light who enables us to see. The sinner was physically blind, but willing to "see" spiritually whilst the religious authorities (the Pharisees, the "righteous ones") were blinded by their dogma. They challenged Jesus on a matter on which they assumed their opinions and interpretations were exactly in line with God's intentions. They were unwilling to accept any way other than their own - even with the evidence Jesus provided them with; thus, they were declared blind. The one thing we should take away from this is that we should never become like the Pharisees and assume that once we have come to some level of understanding that we now fully "see". The ways of God are waaaaaaaaay beyond our understanding. If we learn in wisdom, the more we learn the more we actually learn that we do not know! There is always more to learn, more to see. We are to grow in the grace and knowledge of our Lord, Jesus Christ - but our knowledge must be in faith and whatever is lacking in our knowledge must be filled by faith through our trust in Jesus. We should never trust in our own understanding, but always trust in what He has revealed by examining His truth and recognising our own blindness and limitations - thus glorifying and honouring God! Phew! Are you still with me? This is a bit of a tricky chapter - and one that is easy to walk away from confused and misleaded, but by breaking it down together we can understand what Christ was really trying to tell us. 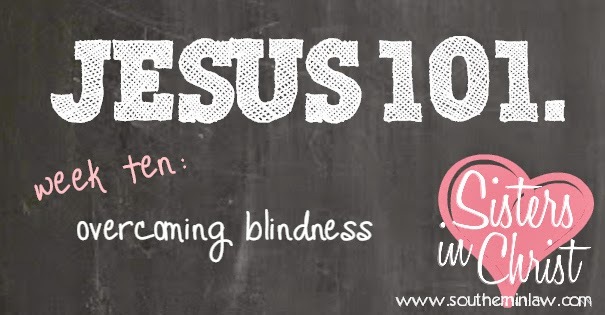 He doesn't want us to be blind - He wants us to walk with Him in the light!